Dan Noel, one of our CTM board members, has created a map of where the churches are located that CTM has established over the past few years. There are now 103 small villages churches established throughout the back-country of Uganda, praise God! 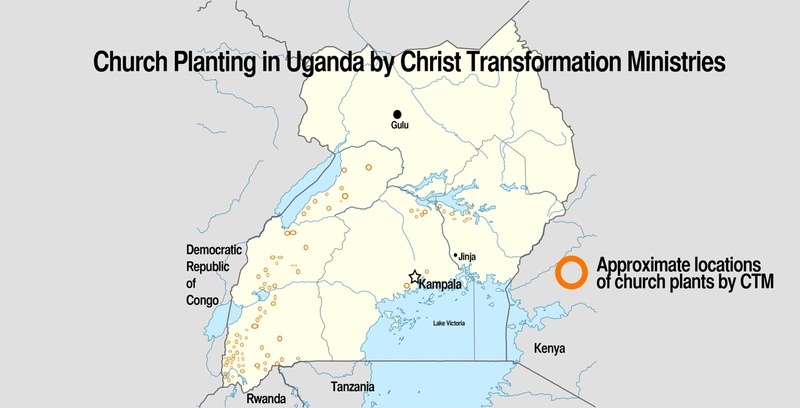 This summer, “Transform Uganda II” will engage, with people from the U.S., Nigeria, and Uganda going back together to many of these churches to strengthen the pastors in these villages, provide medical assistance, conduct building projects, and support the continued spiritual and economic growth of these communities! Watch for our upcoming newsletter, which will provide more details of recent and upcoming events.